What types of subscriptions does Ag Equipment Intelligence offer? What if I am not receiving or able to open the electronic version? Can I manage my Ag Equipment Intelligence subscription online? Yes! If you are a new Ag Equipment Intelligence subscriber you will need to create and activate an online account, you can use your subscriber ID and postal code to activate your online account. Ag Equipment Intelligence offers three different subscription offers for our readers and customers. We have our Free Updates, our Added Analysis, and our VIP Membership. Click here for more information on our subscription options. How do I change the address my Ag Equipment Intelligence subscription is coming to? To change your address in our records, login and update your profile. Please keep in mind we may have already mailed (or have prepared to mail) an issue to your old address. Or you can call us at (800)227-1570 (US Only) or (847) 513-6059 and talk to one our customer service representatives. Login to the website at www.agequipmentintelligence.com. Go to the Help tab or My Account. There you will be able to view your email subscriptions, change your password or update your user profile, note you will need to be logged in to view your information. When can I expect to receive my first Ag Equipment Intelligence issue? You can expect to receive your first issue approximately 20 days after you place your order. Ag Equipment Intelligence is emailed and mailed on the 15th and 30th of each month. You should receive the electronic issue on one of those days. The printed copy will arrive shortly via First Class mail. What if I am not receiving or able to open the electronic version of Ag Equipment Intelligence? If you are not receiving the electronic version of Ag Equipment Intelligence, check your Spam or Junk email folders. To ensure your computer recognizes our email address and does not mark them as Spam, be sure to add us to your safe sender list. If you are receiving the electronic version of Ag Equipment Intelligence but you are unable to open it, remember you must use an activated user website account AND logged in. If it has been a while since you last logged out of your website account, try logging out and then log back in. How can I get back issues of Ag Equipment Intelligence? 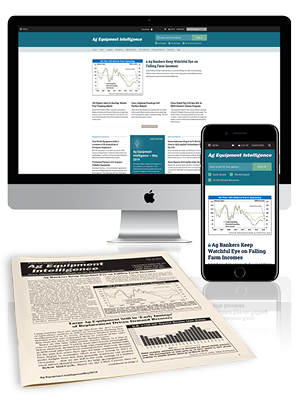 An archive of past and current issues of Ag Equipment Intelligence and Ag Equipment Intelligence Special Reports are available online for active paid subscribers. The best and fastest way is to call our customer service department at (800) 277-1570 (in the US) or (847) 513-6059. Our customer service department wants to help and usually has immediate access to your subscription records. If we need additional information from you, you can provide it! You can also send an email to aeicare@agequipmentintelligence.com It may take up to 24 hours for a response.